Just a couple of days ago, I was tidying up my RSS feed list, when I bumped into Retro City Rampage. As I was reminded it was being developed exclusively for the Wii (or some similarly sad thing), I decided to stop feeding on it's RSS. 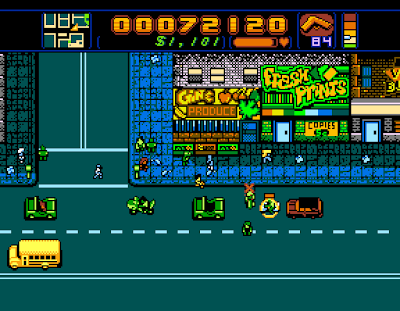 If you don't want me, Retro City Rampage, I don't want you either. Hmpf! But, oh, what is this? Only a few days after our imaginary breakup, the devs are proud to announce it's going omni-platform. Well that was unexpected. RCR is an open world action game that looks like the result of cross-breeding Double Dragon with Ye Olden GTA. Which is to say, a dream come true. Brian Provinciano, The Auteur, promises 50 story missions, over 30 arcade challenges, more than 25 weapons and power-ups, spiced up with 40-ish vehicles. All set in a rather large world with 70-odd interiors. That is a lot of numbers, though I am no mathmathician. If you're getting all giddy from the mere thought of it, you can pre-order for the price of 15$, and get some more or less nifty bonuses, like a digital manual, or a coupon for a shirt. Go figure. If giddiness failed to occur, take a look at some moving pictures. What savagery! A firm release date has not been chosen yet, but the devs claims it is near the finish line.